Lit City Blues: Coming Soon! I wanted to this done much, much earlier in the year than I did, but it seems appropriate that it's finally get heaved over the finish line about three years after I launched The Prisoner and The Assassin out into the world for everyone to read. Part of me is relieved. Sequels are hard, man. I had to keep so many things straight and consistent- which I probably failed at (there's going to be at least one thing in there that I messed up.) There's the pressure of expectations- you're aiming for The Godfather Part II or The Empire Strikes Back when you're talking about sequels- that's the gold standard. If you're lucky you'll get halfway there- I like to think I did. 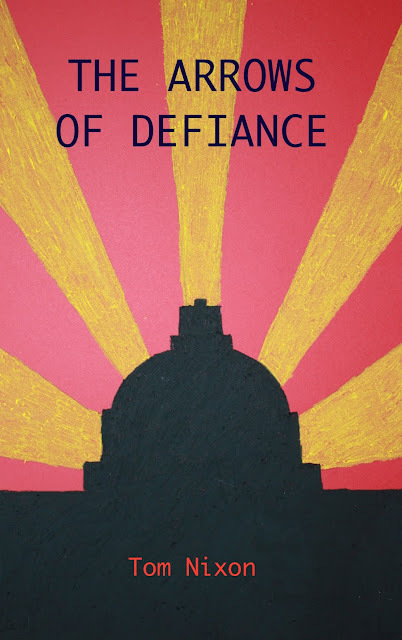 The Arrows of Defiance comes from a speech that Chelsea gives in Chapter Four (it's one of two speeches that survived the editing and revising process more or less intact, which is kind of amazing.) It's a good speech, so I won't spoil it for you. I keep trying to find some sort of emotion to attach to the end of this story, but I can't. The weird part about writing both Prisoner and Arrows has been that it's Part II of the story of these characters- or possibly Part III, I haven't decided yet. The fact that it came out of me that way is something I can't explain, but at some point down the road, I'll have to complete the story of all of these characters and tell the rest of the tale. But it won't be for awhile yet. A word on the cover: I know every indie author, would-be author, marketing professional who happens to read this book is going to insist that I need a better cover for this book. For now, I'm going to disagree with that. I mean, I get where they're coming from, but here's the deal: when I flung Prisoner out there into the world, I made my own cover because I didn't know any better- and didn't have any money to spend on getting a professional designed cover done. It was a little too abstract (the blue star in the cover refers to the flag of the Free Territories, something that I think only I know and any readers probably don't) leaving people with the impression that perhaps, Prisoner is a Dallas Cowboys themed thriller of some kind. When it came time to get a cover together for Arrows, that presented me with a dilemma. My philosophy on this whole writing journey has been a simple one: always do it better. So I wanted to make a better cover, but couldn't exactly go from something I made myself to a slick, professional cover. After many, many long discussions with the Missus, she set to work and produced the bad boy you see above. I think it's an improvement on Prisoner's cover and fits Arrows quite nicely. As you can see above I've left you a little taste of the cover... I'll have the official announcement after the Thanksgiving holidays, but if you lurk on Amazon next week, you might be the first to snag it.